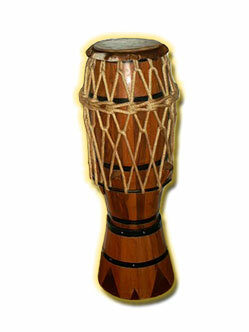 The atabaque is a tall hand drum. The body is typically made of jacaranda wood and the head, fastened to the body by ropes, of calfskin. The atabaque maintains the beat and secures the pace of the rhythm being played in the roda. There are three sizes of this instrument: rum (the tallest with the lowest sound), rum-pi (medium height and medium sound) and le (shortest with the highest sound). In maculele and in candomble ceremonies multiple atabaques are used, but the capoeira roda uses only one.